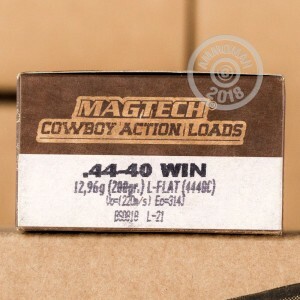 Magtech's Cowboy Action line is a perfect choice to get your vintage firearms shooting at the range. 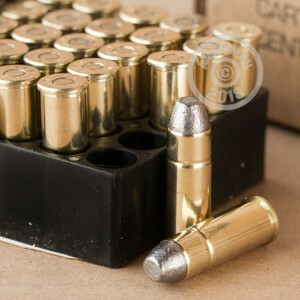 These 44-40 Winchester rounds are loaded into boxer primed brass cases that you can reload. The projectiles are 200 grain lead flat noses that leave the barrel around 721 feet per second. These rounds are loaded to vintage pressures and will function great in your wheel gun or lever action rifle. 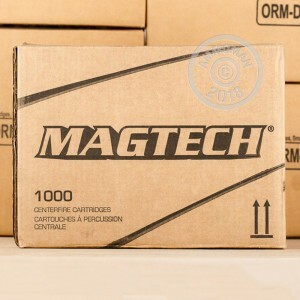 Magtech is one of the four ammunition brand names in the CBC group who is one of the largest ammunition manufacturers in the world. Established in 1990 as the commercial brand of CBC, Magtech ammunition is manufactured in Brazil using state-of-the-art loading equipment. Their products have a reputation for being reliable and consistent at a competitive price point. Do you need more than a couple boxes? At AmmoMan.com all orders over $99 will receive Free Shipping, so buy more and save!